Many renters say they prefer to rent because it is simple and doesn’t carry the stress of home ownership. In truth, they are simply making other people rich. What if I told you that if you purchased a home, you wouldnít have to make any monthly payments on it? On top of this, I’d promise you that when the house was sold, you would get to keep all of the equity gains in the home. Sound like a pipe dream? This is exactly what renters are doing for their landlords. Regardless of how you break down a renting versus homeownership argument, there is one universal fact. If you rent, you are building equity for your landlord. Let’s take a look at a simple example. Assume you rent a unit in a duplex and pay $1,000 a month for it. Assume further that you live in the unit for three years. During this period, you will have paid your landlord a total of $36,000. You can further assume that your landlord’s mortgage payment was less than $36,000 or he would raise your monthly payment. The end all effect of this situation is you have paid his mortgage for three years. Think about that for a minute. Over the three years, you have made every single mortgage payment for your landlord. In doing so, you have helped him build equity in the home through the part of the mortgage payments applied to the principal of the loan. On top of that, the equity growth in the property is entirely his. If you’ve paid off $10,000 in principal and the home has appreciated by 100,000, you’ve just put $110,000 into his pocket. Yep, you’ve been making other people rich. If you’re renting, you will undoubtedly find the above scenario very depressing. Unfortunately, it gets worse. Go ahead and make a list of your assets and debts. List every single thing you can think of and then subtract the total debts from the total assets. Whatever the number is, would it look better if you had added $110,000 to your balance sheet instead of your landlords? 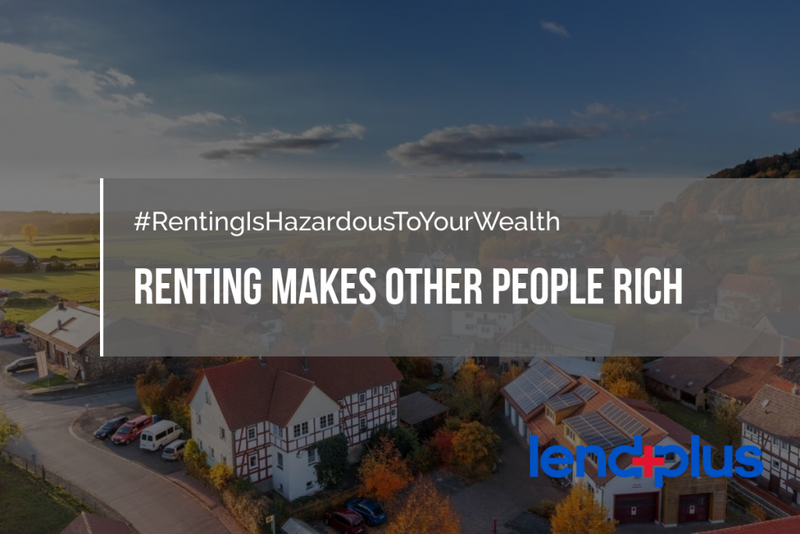 Renting is a necessity, not an option. You should only rent if you cannot get into a home for some reason. With millions of loan options out there, home ownership should be at the top of your priority list.